stangeba had the most liked content! 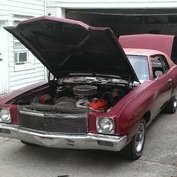 71 Monte Carlos and old In-Line six cylinder engines. Retired from E. I. DuPont Automotive Finishes still working at Langdon's Stovebolt Engine Parts Company. I believe I broke all of mine trying to "slide" them off. I tried to release the latch with a thin piece of metal like a feeler gauge but it didn't work. To keep them in place, I added a hunk of "dum dum" and that has worked. Good luck! Welcome to the club! Great pictures, we love pictures! I copied this article many years ago (1990) and had my 71 set up to these specs. Hooked up the battery charger, getting ready for nice weather! What is your preferred company for fuel/brake lines?